We have had quite the week in the Jenkinson household!!! On Wednesday, we found out that Baby Jenkinson numero dos is a little boy!!!!! We are both thrilled (although I am still completely shocked and cannot believe it) and are very excited to experience being parents to a little man. Kyler painted a pumpkin blue to celebrate! I really am completely shocked. I really thought we were going to have another girl. Chris has been saying boy all along and he was right again! He also said girl all along with Kyler so maybe he is onto something. For those of you keeping track, I am 17w2d today. Somehow I am close to the halfway point and I honestly feel like I JUST found out I was pregnant. This makes me excited/terrified since I know the 2nd half will be even faster. On Saturday, we decided to tackle Disney World for the first time with Kyler. The weather was PERFECT and although the park was crowded, we never waited over 20 minutes for a ride! We only did Magic Kingdom and were there a lot longer than I thought we would be. Kyler LOVED it (of course) and was such a good girl! She napped well, ate well, and had a blast. They have SO many rides that she can go on and it’s safe to say that was her favorite part. Kyler with her Grandparents and Great Grandparents! She did AWESOME and I can’t wait to take her back!! After leaving the park, my phone notified me that I had walked 9.8 miles! The day before was a 14 hour work day complete with a game which my phone told me I walked 9 miles. Needless to say, I was pretty damn tired today! 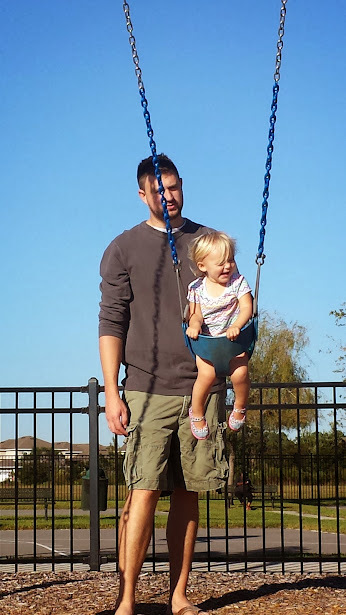 We took a little stroll up to the park today so Kyler could swing and slide…happy life! 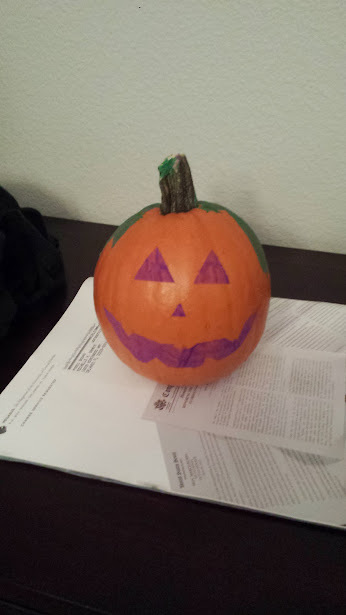 She also painted a pumpkin thanks to Daddy’s help! Also, a HUGE congrats to our good friends and neighbor’s The Gilbertson’s for welcoming their new SON (and brother for Kenley) into the world this morning!!! We are so excited for you all! Off to watch some TV and probably fall asleep 🙂 Have a great week, Happy Halloween and see ya on the flip side! Kyler had her winter clothes swim test on Monday and did GREAT! She is officially done with swim lessons! This crazy girl woke up like this… must have been a wild night! 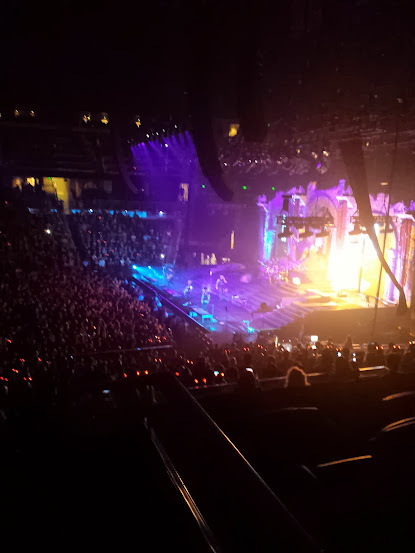 I worked the Avenged Sevenfold concert this week. It happens to be one of my favorite bands so I was a happy girl! But I have to admit that it is pretty damn hard being away from this face ❤ It really makes working late not so much fun anymore. So Kyler has been into the Little Mermaid and is starting to know all of the songs. 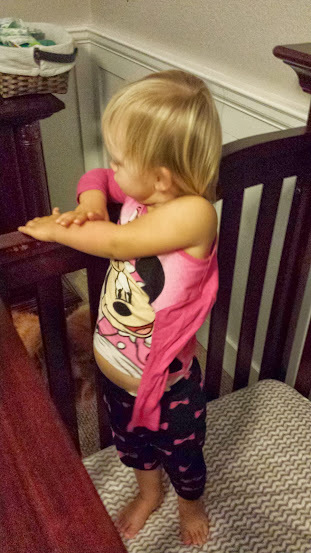 She loves to sing a long so when I saw this “pretty” at Target (only $5… score!) I KNEW I had to buy it…. needless to say… she loves it! Nothing like getting your hair done! 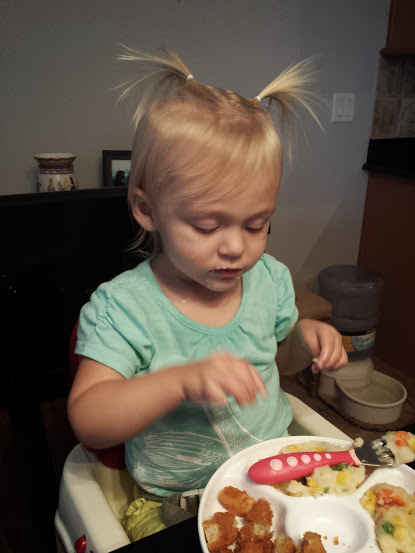 We celebrated Kenley Dee’s 2nd birthday on Saturday!!! 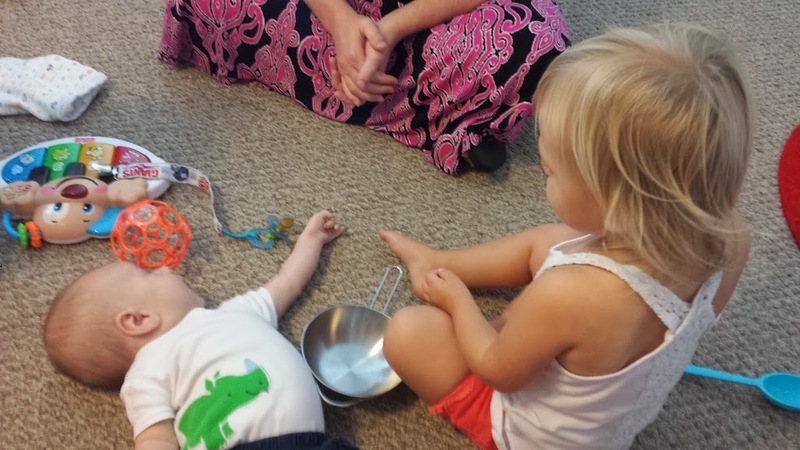 The girls have been besties since the beginning. Happy Birthday Kenley! We made Halloween Cookies with Kyler tonight. At first, she opted to eat the cookie rather than decorate it. Then she got in on the action! I spent the weekend hanging out with my little family and I couldn’t be any happier. Here is to another long weekend and hopefully (fingers crossed) some cooler weather!!!!!! My bestie Jenn and her sweet little man came out to Orlando to visit us. Greyson is 10 weeks old and is such a good baby!! 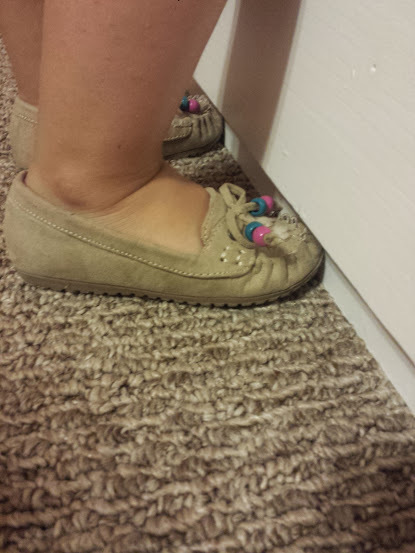 Grandma bought new shoes for her… too cute! This kid is WAY trendier than her momma. This morning, we went out to breakfast at our favorite place Keke’s with the Gilbertson’s. After breakfast, we went to the pumpkin patch! It is really a horse farm so of course Kyler was more interested in that. When did they get so big?! So this was the girls for Halloween 2012…..
SOOO crazy to see how much they have changed in one year! Thanks Kendra for taking the photos!!! Time to root for the Patriots! We had such a nice family weekend and that always makes Mondays that much harder. Kyler has her last big test with swim lessons tomorrow…. she goes in the water dressed in winter clothes! She will nail the test, I’m sure! She is turning into a little fish! My mom watches Kyler 2 days a week and Kyler loves going over to Grandma and Poppa’s. Sometimes my mom takes Kyler out shopping…. one spoiled but trendy little girl! We have one week left of swimming lessons. Kyler has the clothes test this week! She will get put into the pool fully clothed and have to make her way to the ledge. 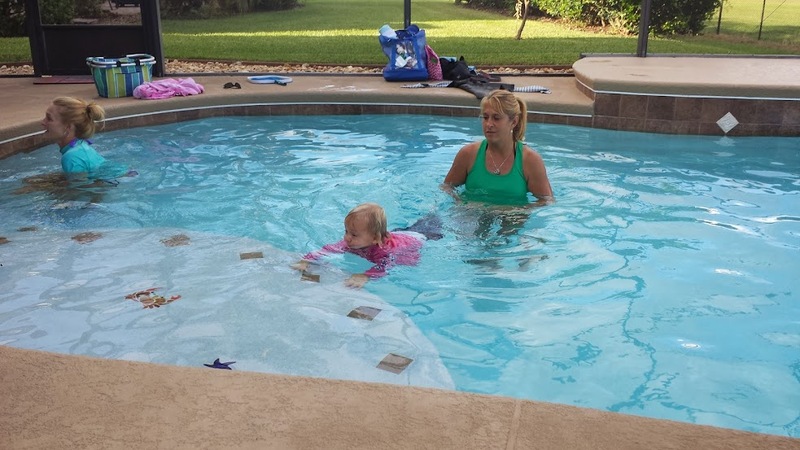 Daddy and Kyler practiced swimming this week, she is doing so well! I had a long night of work on Saturday night. We had a HBO Live Boxing Event in the building. Pretty cool event! Today we went to the toy store (found a $25 gift card, score!) and out to lunch. Poor thing couldn’t even make it home. After our nap (yeah… I napped too), we headed to our weekly trip to Publix. Kyler helped put things on the belt. Tonight, I made a little Polish feast complete with my Grandma’s Fried Cabbage and Noodles 🙂 She used to make her own dumplings that were amazing but I didn’t really have time for that 🙂 Egg noodles work pretty well! Finished product! Nothing really healthy here. We topped off our night with a family movie night. I have been waiting for the Little Mermaid to come out of the vault and it finally has! It is my favorite Disney movie and Kyler was really into it too! I am still exhausted every night so I pretty much hit the bed early. Work is really picking up and our pre-season starts this week! Pray for me! Have a great week! !